William Corwin’s chunky objects, fragmentary assemblages, and thematically installed aggregates are discursive, and recursive works. A veritable time traveler, the knowledge that fills his heterogeneous, interdisciplinary, and multicultural sculptures veer from the mystical to the mundane. His point of view is both speculative and rooted in history and Western Metaphysics. Meanwhile, his aesthetic is intentionally crude, sometimes verging on the abject. On entering his current exhibition, which is titled “Champollion”, we are greeted by a single rectangular slab-like, translucent sculpture in Lucite. Illuminated by lights installed in its pedestal, the somewhat abstract, minimalistDouble Doors of the Horizon is neither pristine, nor like so many of the other objects in the show rough-hewn—unique in its form and materiality, it duly stands on its own. The two parallel holes that pierce the upper third make it resemble a scale model of the swinging kitchen doors in a restaurant, or, perhaps, the peepholes through which one views Marcel Duchamp’s Etant donnés. Given its title, neither referent rings true, however. These are, instead, the doors of perception through which one passes in the quest for awareness and transcendence. What lies beyond, literally, is a large stepped display-stand, made of rough construction grade plywood. This structure, placed on the diagonal, occupies the center of the gallery. It has three tiers on one-side (facing the gallery’s door) and two in the rear. Its top surfaces, on which Corwin has installed his sculptures, are painted a bone white. The show’s title, “Champollion”, is references Jean-François Champollion, the French Egyptologist who deciphered the Rosetta stone. Hieroglyphs are a pictorial form of writing in which each image is a complete concept. From this we may conclude that Corwin’s objects consisting of pre-existing bits of detritus and iconic references are meant to combine to create a new category of hieroglyph. If we are to unlock Corwin’s ideographs, he seems to be telling us we must engage his works as if we were archeologists and cryptologists. In this endeavor, we are left us to our own devices, without a lexicon. 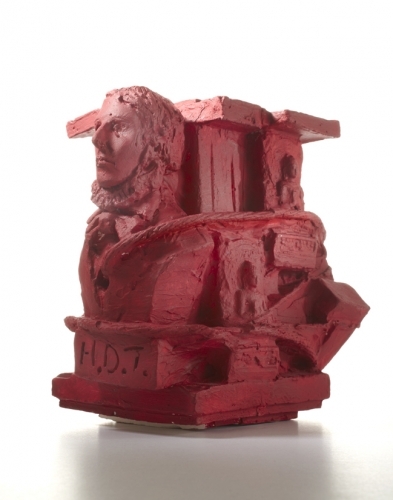 The collection of objects that make up Champollion consists of small sculptures cast in lead, plaster and resin – each material exploited to a different end. These objects invite categorization by format and structure. For instance, Juggernaut or Rath Yattra (2013), Herm (2013),Ouroboros (2014) HDT (Henry David Thoreau) 2013 andBathtub Madonna (2013) are all cast in Hydrocal, and are monochromatic and cube-like, with each side consisting of an assemblage of images in relief. Madonna, (2016) Lion(2016) and Man (2016) are freestanding figures cast in different materials, whose images are somewhat deformed by the process of their production and by their roughly worked surfaces. Ox, Eagle, and another decapitated head (St. John) (all 2015), are still life-like objects with smooth surfaces and cast in lead. All of these works are relatively small, the largest being Herm at 17 inches tall. By using parts to designate whole concepts, and things, Corwin’s sculptural hieroglyphs can be said to constitute a visual shorthand. Subsequently, in Bathtub Madonna he has embedded into an irregular brick structure, a bathtub Madonna — a time honored lawn ornament in working-class, catholic neighborhoods. The work is in the powdery blue color associated with the Madonna. In this manner, Corwin joins together the sacred and the profane. Reciprocally, the four castings of the single image of Lion raises questions about its possible referent. Ancient Abyssinian sculptures of seated lions, used as temple guardians, come to mind, and from here one may think of Haile Selassie, venerated as the Lion of Judah in the Rastafarian religion. This connection to Selassie has to do with the idea that among the differing races that descend from Noah’s son Ham’s children were the Cush from whom the Ethiopians are descended. This game of associations, and connections runs through Corwin’s works, bouncing back and forth within each piece, and between them. Corwin recently spent time in Ethiopia where he visited various biblical sites. In the end, in part because of Corwin’s crude or improvised manner, I could not resist thinking of this installation as being a post-apocalyptic society’s display of objects representing its mythic history and origins. In this scenario, Corwin’s hieroglyphs are comparable to the role the book “The Wizard of Oz” plays in the movie, “Zardoz“ (1974; dir. John Boorman), or the mash up of Celtic Mythology, St. Eustace, and Punch and Judy in Russell Hoban’s novel, Riddley Walker (1980). In both cases, totally misunderstood narratives come to serve as models not only for cautionary tales, but also for the reconstruction of society. If this interpretation in any way corresponds to Corwin’s project, then central to this endeavor is an attempt, on his part, to make sense of the existential appeal of the ontological and the mythic.